Just received my UM2, leveling was straightforward but feeding the (Ultimaker supplied) filament was not. It was difficult to get into the feeder but the instructions said some force may be required so I helped it along. There was clicking of the stepper but that was also expected. When I couldn't get it to move far I turned the printer off and repeated the start-up sequence. Filament got a little further but the feeder seems jammed. I tried to remove the Bowden tube from the feeder but everything seems locked together by the filament, I removed clip, pushed down white collar and pulled with no luck although I didn't try much force. I'm not sure what to do. This is my 4th printer including one kit build but also my first Bowden feed. I've looked at the build instructions and also some articles describing alternate feeders so I'm reasonably confident to take the feeder apart, clean it up and pull the filament out of the Bowden if this is necessary (I don't have any other ideas). Of course this fix doesn't explain what went wrong initially but getting out of the current mess is the first step. I don't really want to start stripping down a brand new machine but my other printers have shown me that there are always challenges. Any thoughts on best way to proceed most welcome. Thank you for your elaborated post. Could you also upload some pictures of your feeder and Ultimaker? This gives us a better idea of what is going on. (hint: pictures are always recommended). 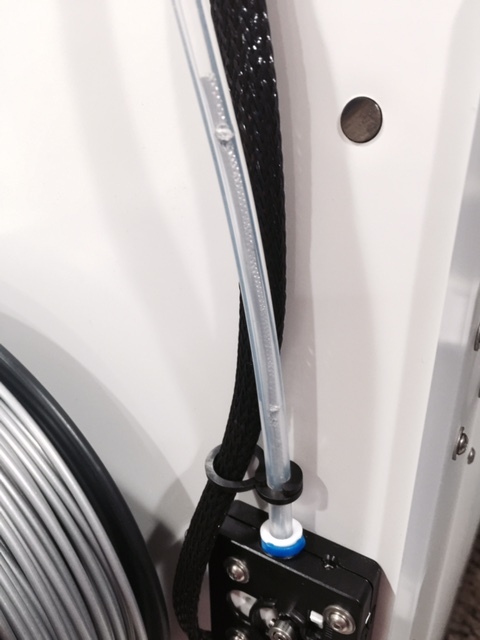 Are you using the wizard to help you feed your filament? The feeder should slowly move into the right direction while you feed the filament, and once you see the first cm come out of the feeder in the tube you can press OK and the Ultimaker will do the rest. Can you also include a picture of the feeder's tension? 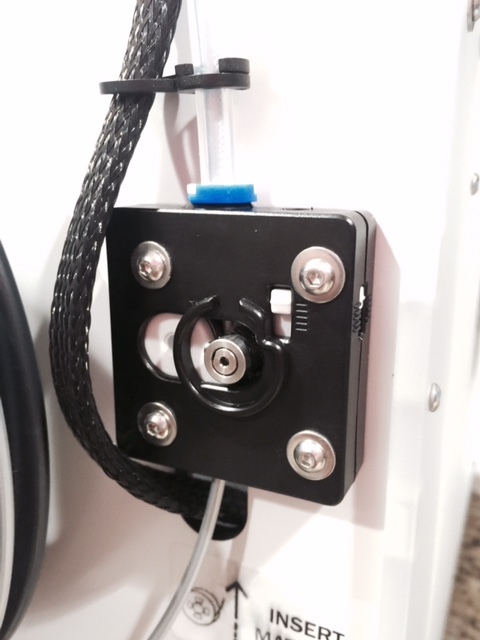 It is the white indicator/block on the side of the feeder housing. 4. remove jammed material and put everything back together. What is the diameter of your filament? The jam maybe caused by grinding of your filament if the friction between your filament and bowden tube is to much. Thanks for the suggestions. I am using the wizard, I tried once more just now and the filament did not move at all during the high speed take up or afterwards. The sleeve is turning but I suspect the filament at that point is seriously ground down and even pushing myself isn't helping advance. The filament is the supplied UM roll. With my micrometer I found it to fall somewhere > 2.85 but < 3, certainly it varies a lot more than the ColorFab or PB 1.75mm I've been using in my other machines. I did check the tension, it is where it should be at the top. The second photo shows the crushed spots on the filament, I'm not sure if that is enough to block the Bowden. I took the feeder apart and pulled the jammed filament out of the Bowden tube. Subsequent attempts to load filament have been OK.